Many thanks to xbrandixx for editing. Once upon a time, in the land of Shenkuu, there was a poor little Moehog who dreamed of being painted again. It wasn't his fault. He had been very excited when his owner had said he was going to be painted with a paint brush they had found on the street. The problem started after he was painted. You see, once he was taken to the rainbow pool, the color started to change him. His fur became hard and he couldn't move his legs. He couldn't move his head either. All he could do was open his eyes. "This won't do," his owner said, "I want a Neopet who is fluffy!" The Moehog was taken to the pound and left on the doorstep in a cardboard box in the pouring rain. As the rain fell, the cardboard box began to fall apart. Even though outside he was cold and stony, on the inside his heart was broken because his owner did not want him. Days went by, followed by cold nights. One day a Blumaroo showed up on the doorstep of the pound. She was very tall. The Moehog envied her instantly because she could move her legs. She was dancing on the doorstep when she saw him. The Blumaroo was rather brainy and resourceful. She reached into her pocket and pulled out a dictionary. Inside she found the definition of a relic and read it out to the Moehog. "It says here that a relic is something cherished for its age or historic interest." "But I'm not even a month old!" said the Moehog. The Blumaroo thought about it for a long time. She stared into the Moehog"s eyes and back to the pound. She couldn't leave him here, but how was she going to move him? Her bet was that Dr. Death couldn't even lift the relic Moehog from the doorstep. If he was going to come with her she needed a way to carry him. "You can come with me," she said, "I'll be back soon!" As she started to run, the Moehog begged her not to go. Finally, a sign of life and she ran away from him! The sky was grey now and there was a loud boom of thunder. He couldn't move from where he was. However, before he could work himself into a serious depression, she was back, and she wasn't alone; she had two Wockies with her. One was starry and the other was shadow. They looked menacing in the dark and he was afraid. The two of them helped the Blumaroo lift him onto the trailer and began to pull. "Thank you," he said, "but do you think you can help me further?" "We can help you," said the starry Wocky. "My name is Fuzzy. The shadow Wocky is Kuro and this kind Blumaroo is Leilei Starcall. Do you have a name?" The Moehog did not say anything. He felt that overwhelming sadness again as he watched them walking. He was nothing but a statue now. "I do not have a name," he said. "My old name was suited to a fluffy pet. I am no longer." "We shall call you Stony if you don't tell us," Leilei answered. "I am Cute, but just call me Cu," the Moehog said softly. They pulled the Moehog for a long time, but it was very tiring work. Cu had serious doubts that they knew were they were going, although they had told him they did, because they kept arguing and pulling him this way and that. How he longed to walk again! Even for just a moment. He wondered if he had any neopoints then remembered he had been abandoned. He no longer had an owner. He no longer had any neopoints to buy a paint brush with. What if he was stuck a relic forever? "You should just leave me here," he said. "I do not want to be a relic forever." "We can't do that," Leilei said. "We have to keep going." They travelled for many days and nights, stopping only to sleep and eat. It was a very weird sensation, trying to eat as a relic for the first time because he needed someone to feed him and even then his lips would not part to eat the food. Not that the food was great; it was clear that these Neopets travelled often because most of their food consisted of terrible sandwiches that had been in their packs for a week or so. The bread was stale, the fruit was half-eaten, but he did not complain out loud. They slept outside, the two Wockies and the Blumaroo huddling together for warmth, while Cu stood alone. None of them would go close to him, because, as Leilei said, he was just too cold. "It's terrible," Cu said sadly, "being so cold. Not even being able to move. Most people mistake me for a statue so they look past me. It's like I am not even here." "But you are here," Leilei said, "and we're going to help you so you don't have to be a relic anymore." He clung onto that hope all night. The next day they travelled to Neopia Central. Cu had been here before but he could see other Neopets staring at the Wockies and Blumaroo dragging him through the marketplace. They passed the shop wizard's tent and stopped outside a shop. "How many neopoints do we have?" Leilei asked. The three Neopets emptied out their coin bags and began counting up their Neopoints. They were short by a few Neopoints to get a yellow paint brush so they decided not to get that one. Cu listened to them arguing about the best color to paint him when he saw another relic Moehog sitting across from him. "Hello, " she said, "do you like being a relic too?" "No," he said, "I miss having feeling in my legs. I miss the days where I could feel the rain in my fur." "I love it," she said. "I can just stay here and watch the Neopets go by. My owner doesn't have to brush my fur or look after me very much." Cu couldn't imagine being happy with being a relic. He knew that some pets enjoyed being made of stone but he wasn't one of them. He couldn't imagine being in this body for even a moment longer. "How do you stand it?" he asked. "I just do," she said. "I knew it would happen eventually but as long as I am happy, nothing else matters." Cu wished he could nod his head, or give some signal, but he knew that he couldn't tell her everything. About how he thought that being a fluffy pet would give him his owner back, or how he had sat outside the pound waiting for his owner to return. And because he was made of stone, neopets thought he felt nothing when inside he felt everything. The other Neopets came over, armed with the cloud paint brush and took him to the rainbow pool. "Are you sure you want to do this?" Leilei asked. As the paint started to take form, he could feel his legs again, he could move again and he was finally free. He could run! 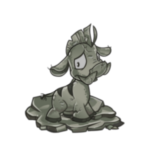 He ran in circles and fell down with the other Neopets and laughed. Everything was over and now he could find an owner again, but for now he was happy to just lie in the grass and feel the sensation of wet grass on his back. And he vowed, if anyone tried to paint him relic ever again, he knew what his answer would be, "No way! "